A 48 year old Pamiri woman poses for a photo in her home. 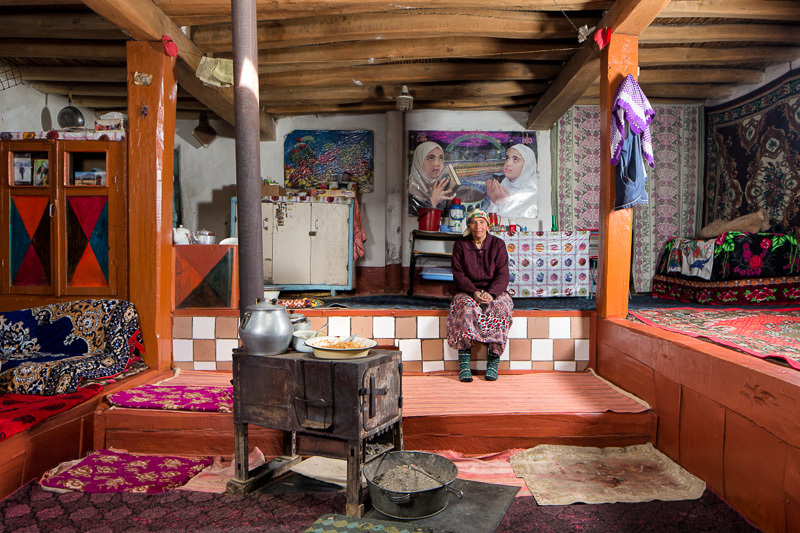 The main area of a Pamiri home is one room, where people cook, sleep, watch television and so forth. In the center of the room is a stove, in which burns wood, cow dung, and whatever other combustible materials are handy. Carpets decorate the walls. Behind the woman is a devotional Islamic poster popular throughout the Middle East and Central Asia. Photo taken on March 27, 2014 in the village Vichkut in Gorno-Badakhshan Autonomous Province, Tajikistan. Wow, humble and charming! Great photo! !